Salt Awareness Week is taking place from Monday 29th February to Sunday 6th March. According to CASH, the organisers of the Action on Salt campaign, evidence has shown that a number of health conditions are caused by, or exacerbated by, a high salt diet. The strongest evidence is for the effect that a diet high in salt has on blood pressure, stroke and heart disease. Again, according to Action On Salt, the average person in the UK is thought to eat around 8.1g salt a day. The guideline daily amount of salt for adults is 6g, which is about a teaspoon. This includes the salt that is contained within ready-made foods as well as the salt added during cooking and at the table. Ready Made Soups: Watch out for the ones which include bacon or ham. Salt is also called sodium chloride, though sometimes labels only give the figure for sodium. To work out how much salt you are consuming from the sodium figure given, you need to time the sodium level by 2.5. For example, 1g of sodium per 100g = 2.5 grams of salt per 100g. 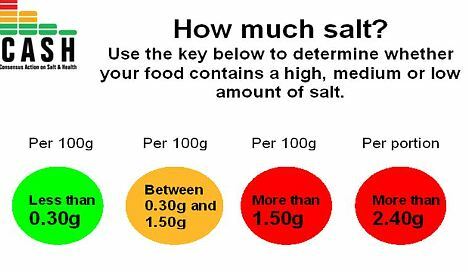 As a guide any product which contains more than 1.5g salt per 100g (or 0.6g sodium) is considered high salt product. A low salt level would be 0.3g salt or less per 100g (or 0.1g sodium). FoodSwitch is a free and simple to use app for smartphones to help you find out what is in the food you are eating, so you can make simple switches to healthier options. For the first time, FoodSwitch allows consumers to scan the barcodes of food and drinks products and instantly see whether they are high (red), medium (amber) or low (green) in fat, saturates, sugars and salt per 100g. Adding salt to dishes enhances the flavour but adding too much can also become a detrimental habit. In fact, a lot of people add salt to their food without tasting the food first. 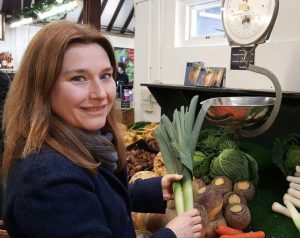 To find out tasty ways to add flavour to your dishes without using salt read my recent guest post on SuperWellness site. 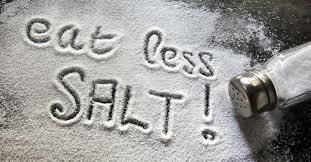 So what are you going to do this week to reduce your salt intake? If you need guidance, don’t hesitate to get in touch. Receive monthly nutrition tips and healthy recipes in your inbox!